The U.S. Department of Agriculture (USDA) is suggesting major changes to grocery stores to "nudge" Americans to purchase healthier foods when they shop. The agency commissioned an "expert panel" to make recommendations on how to guide the more than 47 million Americans on food stamps into spending their benefits on fruits and vegetables. The group released an 80-page report this month presenting their ideas, which include talking shopping carts and a marketing strategy for grocery chains that would feature better store lighting for healthier items. "Most Americans, including Supplemental Nutrition Assistance Program (SNAP) participants, do not purchase enough whole grains, dark green and orange vegetables, and legumes, and purchase too many items with excess calories from fats and added sugars," the report said. "At the same time, the food retail environment is saturated with food marketing messages, including health and nutrition claims and information, advertisements, and promotions for many unhealthy food items," it said. Initial suggestions from the USDA on how to alter the grocery environment include stores offering "SNAP-Ed cooking classes" and consultations with dieticians. "In this approach, the supermarket is the classroom and shoppers receive support on how to maximize their healthy choices using products retailers promote via the weekly store circular," the report said. Another idea included a point-based system where food stamp recipients could receive movie tickets in exchange for healthy food purchases. Grocery store staff could also be used as "ambassadors" for the USDA’s agenda. "In this role, floor staff has the ability to re-direct consumer purchase towards more healthful choices by explaining the incentive or the nutrition labeling system," the report said. The USDA said the ideas are "intended to change the choice architecture of the food retail environment to make healthier choices more prominent," which is in line with first lady Michelle Obama’s stated second term agenda to "impact the nature of food in grocery stores." "These strategies, in particular, draw on principles of behavioral economics to nudge consumers towards healthier choices," the report said. The panel came up with six preferred strategies: discount coupons for SNAP recipients; rebates of up to $60 for healthy purchases on EBT cards; buy one get one free deals for SNAP recipients; a targeted marketing plan to promote healthy food; a USDA loyalty card; and new specialized shopping carts. The "MyCart grocery cart" would provide dividers for shoppers to make sure they are selecting enough items in each "MyPlate" category, the USDA’s food icon. "MyCart is a nonfinancial approach that would use behavioral economics to encourage healthier purchases by any consumer, including SNAP participants," the report said. 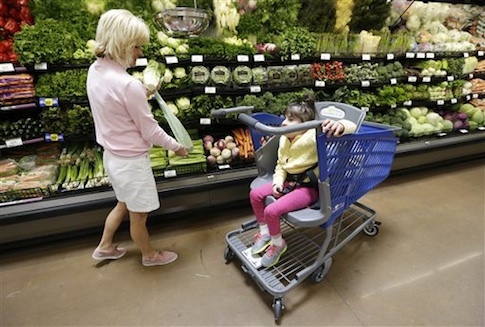 The cart would be color-coded, physically divided, and have a system installed so that when the shopping cart reaches its healthy "threshold" it would congratulate the customer. "The algorithm would group the purchases to classify them using the MyPlate designations and to provide consumers with a message of support or encouragement (e.g., "You achieved a MyCart healthy shopping basket! ")," the report said. The panel based this approach on a $999,891 government-funded study entitled "Nudging Nutrition," arguing the research "suggests an intervention of this sort might be successful in modifying consumer shopping behavior." "To accompany the approach, a MyCart shelf tag could be created to identify healthier items on shelves," the report said. "Consumers could be guided to healthier choices through the use of visual displays and other signage, including ceiling banners, refrigerator and freezer door clings, and shelf talkers." The report estimated that implementing the new carts would cost roughly $30,000 for every store. The change would be costly. For instance, Safeway, Inc. would need to spend $40.05 million to introduce the carts at its 1,335 stores in the U.S. The panel concluded that it was "somewhat unlikely" that SNAP recipients would not be able to easily understand the new shopping carts. Two approaches the report cited as the most promising and easy to implement were offering discount coupons for food stamp recipients and creating a targeted marketing strategy for groceries to promote healthier items. The marketing approach would change how groceries stock and display their items. Retailers would use "signage, lighting, and placement" to make fruits, vegetables, and healthy fare "more appealing to consumers." "The principle of self-attribution suggests that when an individual perceives they have the ability to freely choose between options, they are more likely to be satisfied with the choice they make," the report said. "Using this principle, positioning healthier items for increased salience can support consumers choosing healthier options." Supermarkets would be encouraged to create "healthy aisles," and place foods with higher healthy ratings in "more visible retail space." The report suggested that stores change their healthy promotions over time so consumers do not "become bored" or ignore them. The USDA also recommended standards for how shelves should be stocked. For example: "at least half of all shelf space in the dairy case should be allocated for low-fat or skim milk." Following the report, the two preferred strategies—offering discount coupons for healthy food and changes to store marketing—will be examined in pilot studies. The USDA envisions that supermarkets, superstores, small grocers, specialty stores, and farmers markets would adopt changes in the future through an agency program. This entry was posted in Issues and tagged Michelle Obama, Obama Administration, USDA, White House. Bookmark the permalink.